This study helps assess whether the etiology of clinical hyperthyroidism (where the patient is symptomatic by definition) is diffuse toxic goiter (Graves Disease), acute thyroiditis, or hyperfunctioning nodules. "Society of Nuclear Medicine Procedure Guideline for Therapy of Thyroid Disease with Iodine-131 (Sodium Iodide)." Version 2.0. Society of Nuclear Medicine. You must NOT have had X-ray exams involving iodine contrast (such as IVP or CT) in the last 6 weeks. Most people will stop taking thyroid hormone medicine (synthroid, cytomel, lerothyroxine, lithyronine) 4 weeks before their exam. Check with your doctor before you stop taking this medicine. Do not take any oral iodides (such as Lugol’s solution or SSKI) for 5 days before your exam. Remain off them until exams are completed. Do not take vitamins that contain iodine for 5 days before your exam. Most people will stop taking anti-thyroid hormones, Propothyouracil (PTU), Methimazole, or Tapazole thyroid medicine 4 days before their exam. Be sure to check with your doctor before you stop taking these medicines. Do not eat for 2 hours before your appointment. You may drink water. Bring 2 forms of identification (ID) with you to the scan. You must tell us if you are pregnant, even if you plan to end the pregnancy. If you might receive Iodine-131 (I-131) therapy after the uptake and scan and you are a female of childbearing age, we may send you for a pregnancy blood test on Day 1 of the exam. Plan to be here 1½ extra hours to get the results of the pregnancy test. Tell us if you are currently breastfeeding. You cannot continue to breastfeed after you receive the radioactive tracers. "Thyroid Uptake and Scan." UW Medicine. Accessed 16 June 2012. Society of Nuclear Medicine Procedure Guideline for Therapy of Thyroid Disease with Iodine-131 (Sodium Iodide). Version 2.0. SNM. Iaguru A and McDougall IR. 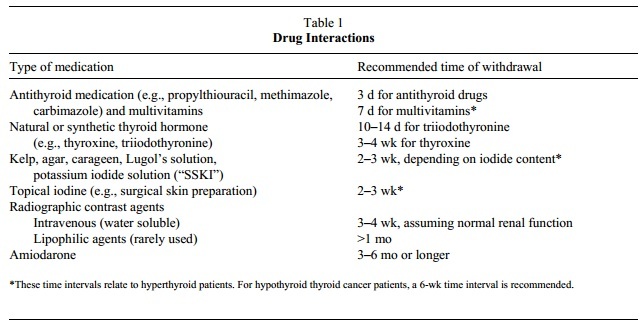 Treatment of Thyrotoxicosis. J Nucl Med 2007; 48:379–389. Intenzo CM et al. Scintigraphic Features of Autoimmune Thyroiditis. RadioGraphics 2001; 21:957–964. Intenzo CM et al. Scintigraphic Manifestations of Thyrotoxicosis. RadioGraphics 2003; 23:857–869. Lee JC et al. "Thyroid scans." Australian Family Physicians. 2012; 41(8):584-586. Wiersinga WM et al. Uninhibited thyroidal uptake of radioiodine despite iodine excess in amiodarone-induced hypothyroidism. J Clin Endocrinol Metab. 1986;63(2):485-91. Cardenas GA et al. Amiodarone-induced thyrotoxicosis: Diagnostic and therapeutic strategies. CCJM 2003;70(7).